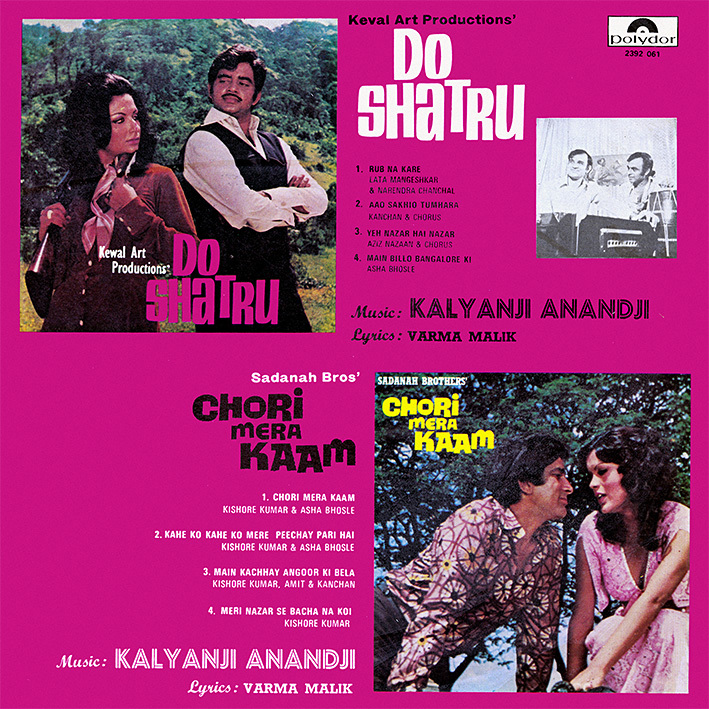 This 1975 Kalyanji Anandji two-fer is nice, though arguably not quite of the quality their reputation is based upon. Both scores have their moments. 'Do Shatru' (the release of the actual film appears to have been delayed five years) sounds mostly traditional, and very percussive. Every song is driven by drums and tablas, almost relentlessly so. 'Rub Na Kare' is my favourite; it is at once trippily hypnotic and infectiously danceable. 'Chori Mera Kaam' [review]  has a more typical 1970s pop feel – although there's plenty of traditional drumming on its title track too. 'Kahe Ko Kahe Ko Mere Peechay Pari Hai' and 'Main Kachhay Angoor Ki Bela' are both good; fun and comparatively funky, but perhaps not songs one remembers for a long time. 'Meri Nazar Se Bacha Na Koi' is the score's (and the entire record's) highlight: a mysterious sounding into, great melody, soulful horn section, cool interludes and groovy tempo shifts.